A report by David and Vicki Bryant discussing 252 species of birds including 33 endemics plus 10 night-birds with Amila Salgado of Birdwing Nature Holidays. After a nap and lunch this was the first site visited and a good introduction to the common birds of Sri Lanka. As a surprise Jith took us out for an evening meal to the Cricket Club. This is where all the visiting test sides go and is steeped in cricket history and memorabilia...John Kirby reports. After stopping to admire elephants we then focused on woodshrike for the rest of the day. Just after the last elephant is a box bridge across a river. We parked here and looked for woodshrike, no luck but we did get a nice Malabar Pied hornbill and Jerdon’s leafbird...Michael Grunwell reports. Here we saw mainly endemic species, the highlight was a male Sri Lankan Frogmouth on a nest near the research station...Ray Kite reports. Sri Lanka (A family "Birding in Style" trip report.) 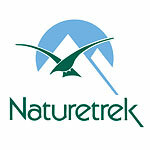 16th-30th Dec 2009 a report in .pdf format (1.3Mb) by Stephen Lowe on behalf of Birdwing Nature Holidays. (c) Amila Salgado/Birdwing Nature Holidays! As a birding destination, Sri Lanka has got the lot with a good number endemics, tropical beauties and excellent wetlands. Most trips see around 220 to 260 species over 2 weeks...Craig Howat reports...lots of pictures. ..Ten minutes more of intense scanning to find the source of its ventriloquial call and we were all enjoying cracking views of a Serendib Scops Owl, which had eluded the bird watchers until 2001 and us for a little over 2 days! Needless to say it was justifiably rated as the bird of the trip.....Amila Salgado reporting for Birdwing Nature Holidays. The purpose of this short report is to provide some up-to-date, specific birding information based on a recently made trip to Sri Lanka in autumn 2008. Whilst there are many reports already available online, almost all are from the peak (winter) season...Oscar Campbell reports. We found Sri Lanka very different from India – much quieter, less frenetic, less smelly, cleaner and generally less of a culture shock. Really quite calm and laid back. Even the driving is quieter – when an oncoming bus overtakes in a stupid place and you have to pull off the road to avoid it hitting you there is no hooting or shaking of fists – just calm acceptance. I suppose Buddhism must be a factor here...Rosemary Royle reports. We had planned a visit to Sri Lanka for many years and had such an enjoyable, relaxed and rewarding trip that we wished we had done so long before. Birds are abundant and tame everywhere we went....Carol and Tim Inskipp report. 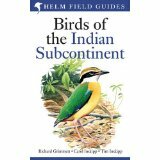 With Rohan’s help we identified some spectacular birds, 230 species in all, including 25 endemics and a number of species we had not seen before Peter and Margaret Whiles report. After some lunch we went to the Talangama wetland area to see our first Sri Lankan birds. This is a typical mixture of tank and paddy and a very pleasant place for our introduction to the Sri Lankan countryside. It which yielded a good number of interesting species, notably Purple Heron, Yellow Bittern.....Alf King reports. All in all, not a bad 8 days birding for a very reasonable ground cost... If not for the time lost could well have picked up more birds, but there are always such factors. We were very satisfied....an then the most eventful, memorable Boxing day I can ever remember....Robert and Anne Jarvis report. This report describes how it is possible to see all Sri Lankan endemics (as broadly defined by Baur's) in eight days of birding. 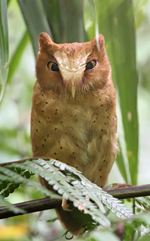 The sole endemic we did not attempt to see was the newly-described Serendip Scops-owl, which is seriously endangered and probably is better not disturbed...Gary and Marlene Babic report. Sri Lanka is a pleasant and friendly country to travel in, a little like India but without the huge population, the beggars, the cows and the hassle. The scenery is interesting and the various parks and reserves are managed efficiently...Wendy Newnham reports. This was a great birding destination for a two week break. It was cheap, very easy logistically (thanks to Baur tours), with very friendly people, a descent list of endemics all within a reachable distance and great beaches to relax on afterwards...Stuart White reports. 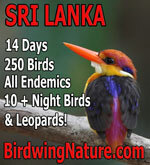 Sri Lanka - Order FREE Brochure! Often described as a "Biodiversity Jewel", this is the best travel book on the market for a quick overview of some of the gems of Sri Lankan Wildlife and where to see it. 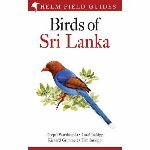 This field guide describes and depicts all of Sri Lanka's 426 official avian species. The text, highlights the important identification features, such as plumage variations, size, calls and songs, range, distribution, and status, for every species. The plates illustrate the various plumage variations for each bird, and show the birds perched and also in flight. 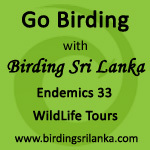 An introduction to the guide describes briefly some of the best sites for watching Sri Lanka's abundant avifauna. This guide to birdwatching in Asia deals with over 250 sites in detail, and more in passing, from Turkey to Thailand and India to Indonesia. 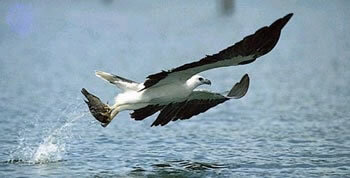 It is designed as much for pre-planning birding trips as for use in the country or countries on the itinerary. The countries are dealt with alphabetically and after a general introduction, there are site details, which include a list of birds to be seen, organized under the headings "Endemics", "Specialities" and "Others"; a list of "Other Wildlife" is also included where there is something of particular interest. For the visiting wildlife enthusiast there are details of all of countries National Parks, with hints about the animals and birds to expected and a full colour photographic wildlife section. This guide to Sri Lanka also provides practical information on most aspects of travel, including health and safety advice, information on local cuisine, advice on customs and etiquette, historical and cultural information, and maps.